We are starting the third week of BM#57 and for this week I will be sharing Wholegrain dishes, approved by kids for my Kids delight event, themed on Whole grains. The week passed away quite fast and I am not ready with other dishes. However this roti was inspired from the result of a baking failure which I must say was my first ever failure. I was baking yet another of my Banana Bread and was trying with wheat flour. I didn’t add enough baking powder and the resultant cake was a flat one, it didn’t rise at all. Seeing how much flour and banana got wasted, Athamma had another and she made a roti out of it with Bajra. When we tasted it, we loved the taste. She said she remembered her mom making Banana Bajra Rotis. 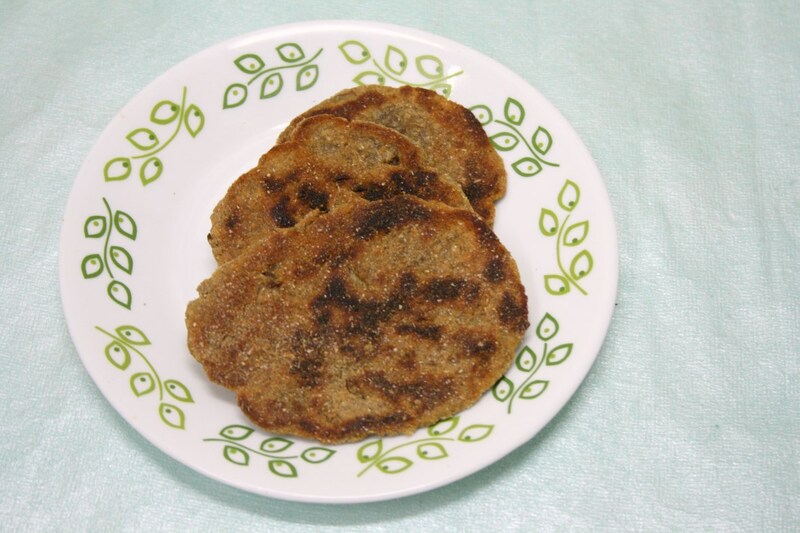 Bajra or Pearl millet, is one of the most common Millet she uses at home and we always stock it. So after a successful recreation of the dish, we felt we should add the banana directly to the bajra and make a roti. Even the plain banana with jaggary tastes great and Konda enjoyed her snack. This month’s Kid Delight’s edition is hosted by Kalyani, themed on Cooking with Whole grains. So sending this off to her! Grate the jaggary and pulse it with banana. Take about 3/4 cup of bajra flour and add the puree. Mix it well and slowly add the rest of the flour. Mix into a stiff dough, add more flour if required. Then grease a plastic sheet with oil, and pat down a ball of the dough into a disc. Rough apply the sesame seeds on the top. Cook on a hot tawa on both sides, drizzling oil and ghee on top. The measurement is all approximation. Depending on how much sweet you want, you can increase or decrease the ingredients. It is always nice when a cooking disaster / failed recipe leads to a new excellent recipe. Sweet version of Bajra roti sounds delicious. That's a new combo ! Surely sounds interesting and delicious . Wat an different and healthy roti..thats really very interesting to make a failed recipe as a prefect one. What a lovely way to make kids eat healthy wholesome rotis. Adding banana gives another power boost to this recipe. Nice one. 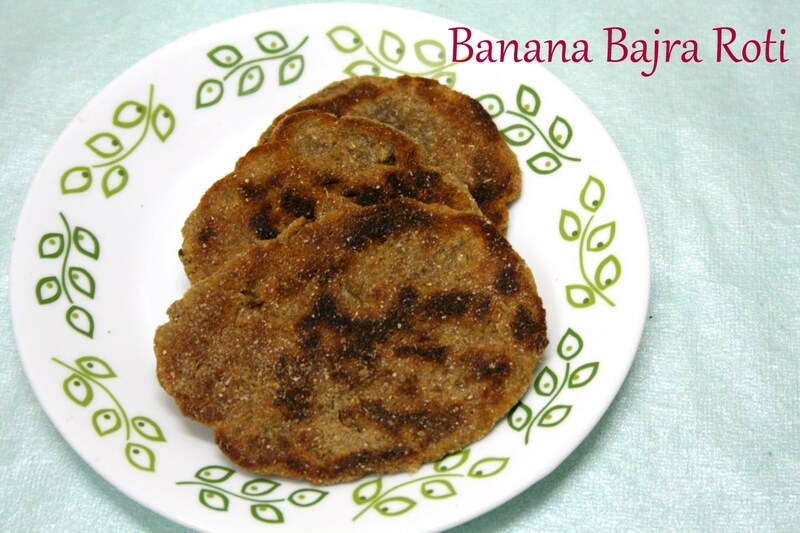 Sweet bajra roti with banana sounds wonderful.Must have tasted great. What an interesting bajra roti with banana. Looks nutritious and delicious. They sound just like the sweet ragi roti. Love to try it out. Wow…banana and bajra…sounds cool. And kitchen disasters usually lead to more creative dishes….that's awesome! I always somehow feel that your MIL is really cool even though I don't know her personally and get glimpses of her thru your posts. She has come up with really yummy version of sweet rotis. Banana bajra is new to me. Its great when you can save a failure by trying out something else from it! Healthy rotis from a failed dish. yummy and healthy recipe.. I have tried this recipe for my daughter.